There are a lot of decisions that need to be made when thinking about buying a new truck or SUV. It’s important to find the right vehicle to match your lifestyle, not just your budget, but how you live, work, and play. As a GMC Orlando dealership, we understand that, which is why we work so closely with our customers to make sure they drive away in the vehicle that fits into their lives seamlessly. There are a lot of options available to you, but taking a closer look at what GMC is offering in 2019 can help narrow down some of your choices and give you a sense of direction as you look for the right vehicle. The 2019 lineup for GMC in Orlando is really exciting, with many new models that are brimming with great features for all sorts of purposes. Whether you are looking for an SUV to get your kids to school safely, a truck to be your new workhorse, or a ride for you and your friends, there is something for everyone. Come take a look at what GMC has to offer in the coming year, and find just the right truck or SUV for you. Looking at all the GMC models available can quickly become overwhelming, and that’s after you narrow your search down to just one manufacturer. We understand how quickly all the choices and options can become too much to think about, which is why it helps to just take it one model at a time and see what is out there. Looking at brand new models can help, since it shows you the high mark for features and available options, but there are also great choices if you are interested in a used SUV or truck. Here are the upcoming 2019 GMC SUVs; keep in mind these are standard models, variations with more power and options are also available. If you want an SUV, but you don’t need a massive ride with a ton of room or towing capacity, then this is a great place to start. The Terrain is an SUV that gives you command of the road without being as large as some other models, which is perfect if you’re a little intimidated by the size of some SUVs. This is a great choice for a GMC in Orlando, since it gives you the size and power for going to beach parties, tailgating, or just hanging out with friends and family on the weekend, without being more than you need. When it comes to power, it has 252-hp available and a towing capacity of up to 3,500 lbs. Plus you get up to 30MPG on the highway, which helps keep your gas costs down and makes this a more practical SUV for a lot of us. Even though this isn’t the biggest SUV offered by GMC, it still has great tech features including compatibility with Apple CarPlay and Android Auto, along with a customizable touchscreen display and available built-in navigation and 4G LTE Wi-Fi hotspot functionality. Looking for a bigger SUV from a GMC? Then the 2019 Acadia is a great choice, as it provides more seating and power than the standard Terrain. This is a larger vehicle, which means you can fit up to seven people in this ride, making it a great choice for family trips, friends going out on the weekend, or helping a friend move – though we’ll stick to trips and nights out. The Acadia is not just roomier on the inside; it is also more powerful than the Terrain, making it a great choice if you need it for hauling loads or a small camper around. It has a maximum towing capacity of up to 4,000 lbs. so this is ideal for a work vehicle and for driving the family to the beach. 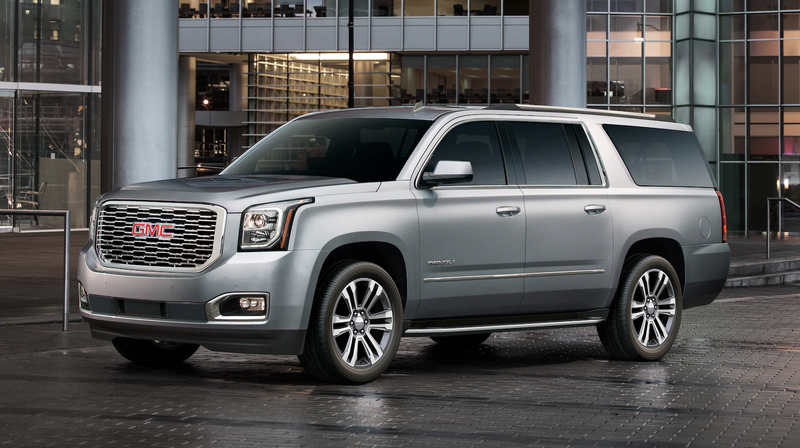 If you really want to step up size and performance when looking at an SUV from GMC, then the Yukon just can’t be beat. The 2019 Yukon has room for up to nine people, which should fit just about any family or group of friends going out. If your party is bigger than nine people, then they will just have to draw straws to see who gets to ride in your new Yukon, and who is left following behind. Towing capacity of this SUV tops out at up to 8,500 lbs. so this is a great choice for hauling a camper or trailer. The Yukon includes all the same great connectivity features of other new GMCs, such as compatibility with Apple CarPlay and Android Auto and an 8-inch touchscreen display with available navigation features. There are even up to 13 charging locations, so everyone in the 2019 Yukon can charge their devices at the same time. SUVs are great, but sometimes you just need a truck. When looking at GMC trucks in Orlando, there are a couple of baseline models to consider, depending on exactly what you need. That’s what buying a truck or SUV is really all about: figuring out what you need for every aspect of your life, and then finding that right vehicle to check-off all your boxes. 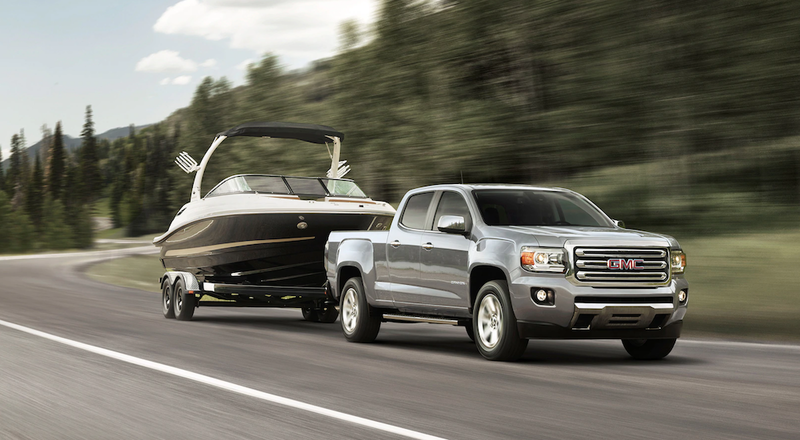 For a lot of people, the 2019 Canyon will hit the sweet spot for power, towing capacity, and overall performance. While additional models are available, the standard Canyon has 308-hp and can tow up to 7,700 lbs. while providing 30 MPG while driving on the highway. If you want a truck, and need some solid towing and hauling power, but you don’t want anything that might be too large for your home, then this is a great choice. There is nothing wrong with wanting a truck but not needing the maximum amount of power available. If you do want that extra level of performance, however, then look no further than the 2019 Sierra. This is a great GMC for Orlando because it can handle just about anything you throw at it and is ideal for both work and play. The 2019 Sierra has up to 420-hp, which helps provide up to 12,100 lbs. of towing capacity. This truck can haul a massive load of lumber or drywall, then turn around and carry your coolers and grill for some serious weekend tailgating. But that power doesn’t come at the sacrifice of comfort or other features. The 2019 Sierra includes a beautiful interior with a touchscreen that offers Bluetooth connectivity, plus a trailering system that makes it easier for you to haul a trailer or camper safely. We already talked about the 2019 Sierra, but we had to take a moment to brag about the Sierra 3500 Denali HD. This truck is the pinnacle of performance and power thanks to a diesel engine that provides 445-hp, offering a maximum towing capacity of 20,000 lbs. and a maximum payload of over 6,000 lbs. It is an absolute beast and we love it! This is just a sample of what we have on offer from GMC in Orlando. These are the shiny new 2019s, but we also have plenty of pre-owned vehicles on offer for you to look at and choose from. Buying a new truck or SUV can be intimidating, which is why we focus on working with you to make the process simpler and more accessible. 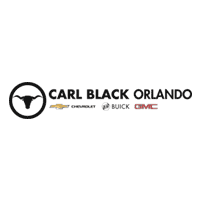 Come down to Carl Black Orlando so we can show you what’s available and take the stress out of buying a new vehicle.